Larry Fitzgerald and the Arizona Cardinals will collide with Sam Bradford and the St. Louis Rams to kick off Week 15 on “Thursday Night Football”. The affair is just one of many important match-ups on the NFL Confidence Pool Week 15 sheet. Start making a final push with the instantly downloadable and printable NFL Confidence Pool Week 15 sheet. If you prefer to just pick the winners, you can do so with a standard Week 15 Pick Em pool. Both printable pool sheets are free from PrintableBrackets.net. The Cardinals and the Rams have been meeting in NFL games since 1968. In terms of the all-time series, the Rams enter the 2014 NFL season with a slight 22-21 lead in the all-time series. The Rams have also beaten the Cardinals three out of the last four times they’ve met. The matchup is the penultimate “Thursday Night Football” game of the 2014 season. 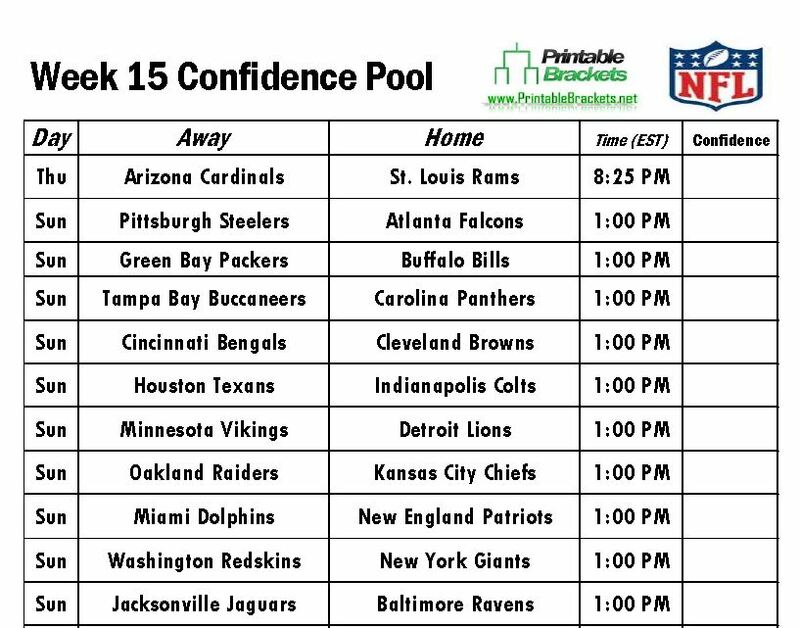 Meanwhile, plenty of games expected to have playoff significance are listed on the NFL Confidence Pool Week 15 sheet. In early Sunday action, the New York Giants will host the Washington Redskins, the Atlanta Falcons will welcome the Pittsburgh Steelers, the Miami Dolphins will meet the New England Patriots, while the Kansas City Chiefs will host the Oakland Raiders.